When I mentioned in the previous entry that I grew up with air travel in my blood, I wasn’t kidding. Here’s some documentary evidence. 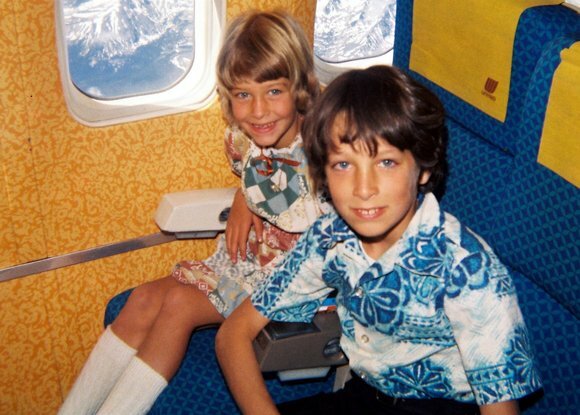 Dated Easter 1980, when I was nine-and-a-half years old, this picture shows my sister and me flying unaccompanied on a flight from San Francisco to Kansas City. Traveling on employee passes, since my father worked for United, this was probably one of our earlier flights flying solo. The plane is a Boeing 727-022. Check out the funky wallpaper! A sneak view into First Class on the same flight. Different wall treatment up front. This was in the days when United operated a nonstop between SFO and MCI. In fact, twenty years or more after discontinuing the nonstop service, a few months ago United once again resumed nonstop service on this route using United Express partner aircraft. After the nonstops went away (following deregulation) the name of the game was Denver Stapleton, one of United’s two largest hubs. In the years leading up to the opening of the new airport in Denver, United’s operations were so overcrowded they would park a second row of airplanes behind the row pulled up to the gates, leading to domino effects of delays if one of the planes in the back couldn’t leave on time. Here’s a Boeing 727-200 with Continental’s DC-9s behind. This was in the days when United, Continental and Frontier (the previous version of it) all had hubs at Denver. 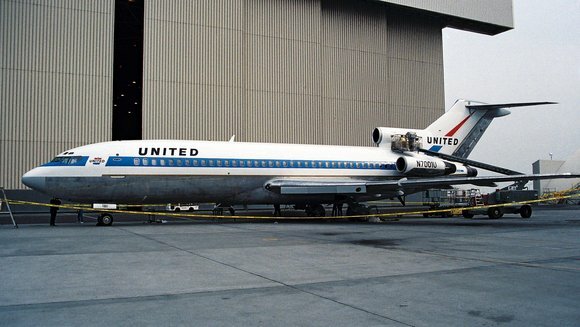 In 1992 as United was phasing out its Boeing 727-022 aircraft, it donated this one, its first 727 (note the registration number N7001U on the engine) and in fact the first 727 ever produced, to the Boeing Museum of Flight in Seattle. One of her sister ships (N7017U) was donated to the Museum of Science and Industry in Chicago, where it remains on display to this day. In preparation, mechanics repainted the plane to its original paint scheme, hand-taping all of the logos and detail work. I had the opportunity to visit United’s Maintenance Operations Center in San Francisco and walk around taking pictures of this plane. This entry was posted in Uncategorized and tagged Airlines, airplane, aviation by christao408. Bookmark the permalink. Cute kids! I didn’t remember you two flying solo (duet) so early. How fun to see the old 727”s! And they finally test-flew the new 787 a couple of days ago! 1. I remember the funky wallpapers and clothes. Didn’t last too long into the 80’s. You know the interesting thing? That flight attendant probably STILL works for United. I remember that old UA cabin. Wow, it’s been a while hasn’t it?I still work with UA to this day; I’m at their cargo terminal every single day. It’s interesting I think, that when an airline changes a bit, at first you go “whoa” and then you get used to it; but then we look back 25 years later and almost can’t believe the planes used to look like that.I think it’s kind of funny, seeing such a large age difference between readers here; seeing the old photos. I remember flying UA in 1980 as well. And I think, wow, about 90% of my readers weren’t even born yet. Maybe even more than 90%. Some weren’t even born when I was graduating from High School even. And yet, there are those here who look at us like young men; who in 1980 were already deep into their professional careers when we were just children.Incidentally, looking at your 1980 photo, you look like my childhood best friend Charlie. It’s odd. Cute pictures … they remind me of trips from Mexico City to Acapulco or to San Antonio, Texas for shopping although I’d fly AeroMexico or Mexicana for domestic flights and PanAm had the best international routes in and out of Latin America. Love that first picture. That wallpaper’s grand. Love the pictures! They brought back a lot of memories! Do you remember the Mexican Restaurant in Stapleton that we would frequent during long lay overs and/or missed flights to and from MCI? @arenadi – I have always been curious what you do (aside from being an all around nice guy). I think there used to be an entrance in the rear of this plane right? 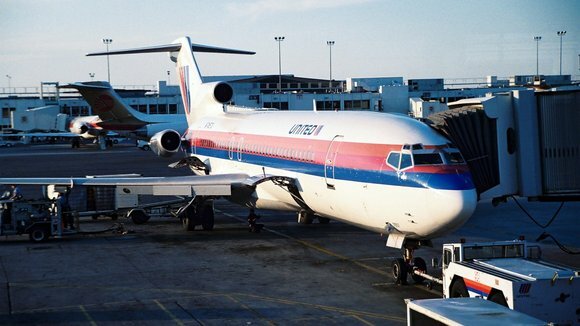 @ElusiveWords – Boeing 727 has a rear air stair, yes. Not normally used for boarding but sometimes. Even when not used for boarding, the stair was lowered as it provided support for the rear end of the plane (three engines) when the plane was otherwise empty. @oldpartner – That restaurant, which was very tasty, still operates from concourse A of the airport, actually. @Rm2046 – My mother got hold of a lot of that Hawaiian print fabric and I think all four of us had shirts or mu-mus made of it. @epiginoskete – Isn’t it, though? @TheLatinObserver – PanAm had the best Int’l routes anywhere! @arenadi – It is interesting, isn’t it, the range of readers? Of course, your core followers are a bunch of near-teen girls, right? Ha ha… just kidding. @iskrak – No longer available at a wallpaper store near you. @LostSock21 – Ouch! I bet she IS still working for them. @slmret – I’m very excited for the 787. I think it will be a big step forward for passengers. @jandsschultz – Since it was a nonstop, I don’t think it was much of a concern. We weren’t going to get lost anywhere. @Dezinerdreams – Yes, young man. Note my voice of wisdom and experience when I comment on your blog! LOL@yang1815 – Yes, it is. @Wangium – The smell of stale smoke and peanut oil is evocative of air travel for me. @christao408 – I’m very excited for the 787 also. I remember when the 777 came out, I thought it was the best thing since sliced bread. And no kidding about near-teen girls; my goodness. I think the average age of my reader is 19-20, haha. 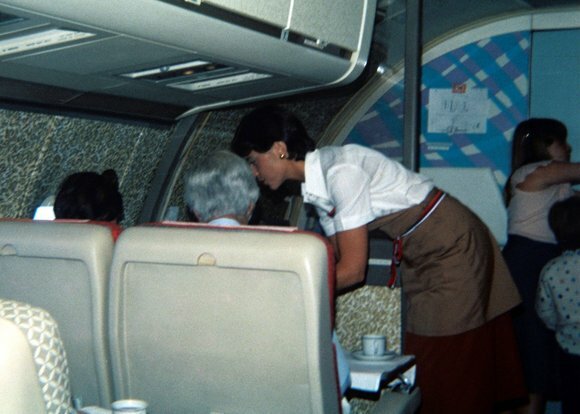 @arenadi – I have another picture, didn’t turn out as clear, of 1981 when UA introduced the 767 into service. There was an open house day at the maintenance center before the plane went into service and we were able to walk through it. All the seats were covered in plastic and it had that “new plane” smell. cool……love those vintage wall paper, oh my one and only ride on the UA B727 was in DEC 1995 while transiting in SFO from JFK to YVR just to spend a few hours seeing my relatives at the SFO airport. @christao408 – I forget that the 767 has been in service for so long, sometimes. Then again, I forget how many years have passed.While we’re talking about aviation, when I was at the UA Cargo terminal the other day, I saw an An-225 sitting on the tarmac. At least I think it was an An-225; or rather THE An-225. That thing is gigantic. Have you ever seen one? @christao408 – I last flew PanAm back in the summer of 1988 MEX – JFK – LHR and back. Love the shirt! I graduated from college in 1979 – so the wallpaper brings back fond memories as does the wide collar on your shirt and the peasant dress your sister is wearing… Haha. But wasn’t that just yesterday? Where has the time gone? I remember flying solo when I was like 12 and I was freaking out. Thankfully the stewardesses were nice.Cool pictures. I love airplanes. @free2chuze – Have you flown since without freaking out? =)@murisopsis – Same place the windmills in my mind have gone…@yang1815 – I have scads of them. Just slowly figuring out what to do with them. @TheLatinObserver – Just a few years before their collapse. @arenadi – Not live and in person, although we just impounded one of those here in Thailand for an illegal arms shipment. @agmhkg – 727 was my favorite plane, especially the -100 series which had the economy galley located mid-plane. Back in Kansas City I have some old UA seat maps, I’ll have to scan the one for the 727. @christao408 I overcame my fear of flying. I’m ok now. Haha. WOW those photos are a blast from the past! I love the look and feel is times gone by. So did one of the flight attendants take the photo for you two? There is a sort of planned community (mixed use zoning) where the old Stapleton airport used to be! I love that they finally used the old footprint. It took them quite awhile. I remember the funky wall paper very well. Your sister’s expression and smile is so adorable. Look how well kids used to be dressed when they flew. So proper and perfect!! See the kids now when they travel?? Even adults for that matter. Love this entry Chris. Thanks. @TheCheshireGrins – It is supposed to be a nice development from what I’ve heard. The funny thing is, when they built the new airport there was all this derision about how far it is from downtown. And now the growth is beginning to spring up around the airport and it no longer seems like so far out in the countryside. @ZSA_MD – Traveling on airline passes there were strict dress codes. Shirts and slacks, dresses for the women. If I wanted to fly in First Class I had to have a tie and jacket, no exceptions. @christao408 – would like to hv a look of the seat map…..